Alexander R. Poulin, Rockland County Executive Ed Day and Parker J. Stone. 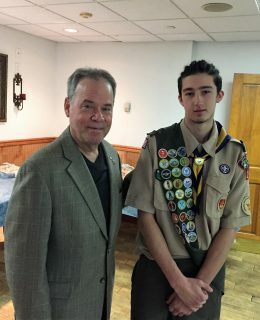 Rockland County Executive Ed Day was on hand this past weekend to welcome three young men into the ranks of Eagle Scout at their Court of Honor ceremonies. 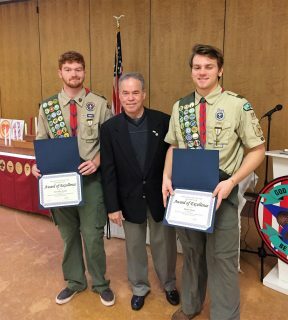 Nicholas Granone Troop 19 in Pomona, as well as Alexander R. Poulin and Parker J. Stone of Troop 78 in Nanuet, were initiated as Eagle Scouts, the highest rank within the Boy Scouts of America. To earn the rank of Eagle, a scout must earn at least 21 merit badges and demonstrate leadership and community service by organizing carrying out an Eagle project. For his project, Nicholas restored Calico Hill Memorial Cemetery in Garnerville. He put down new mulch around the war memorials there, planted flowers, power-washed brick and repaired the site’s gazebo, benches and fences. Stone’s project took him outside the country. He traveled with other students from Don Bosco Prep to Nicaragua to help build a house for a family in need and brought school supplies for children. To earn his stripes, Poulin tore down the old playground at St. Francis of Assisi Church in West Nyack and built a new one. Eagle Scout is a rank earned by only 2 percent of Boy Scouts.